3: Their Stanley Cup Playoff experience beginning Wednesday may be a short one as the result of the many profound issues that have recently emerged or remerged. However, a fourth thing is also true: The Jets still put in some gripping and dominant performances in 2019. In late December, we looked at the Jets’ five most exciting, exhilarating, and electrifying games prior to the Christmas break. Now let’s revisit their top five since then. The Jets came into the Feb. 22 matchup at T-Mobile Arena having never won there. The Jets desperately needed the Friday night victory as theywere slumping badly and had captured just two wins in their previous eight games. 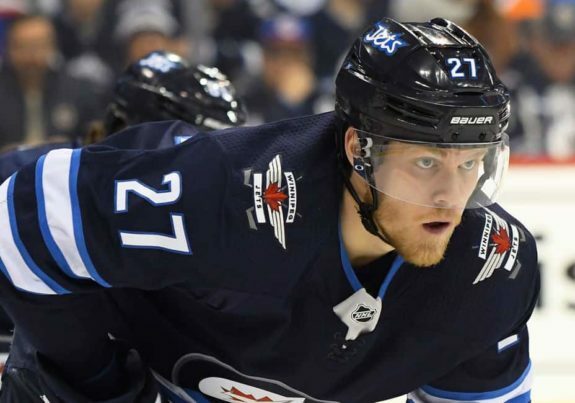 The game saw the return of dynamic Dane Nikolaj Ehlers, who’d missed nearly two months with an upper body injury. 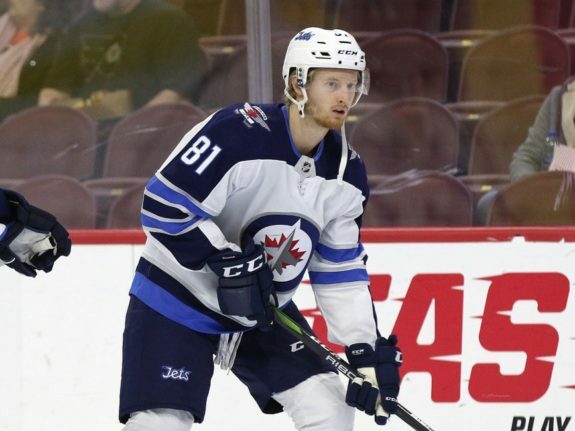 Ehlers made an immediate impact, notching a goal just 56 seconds in, and Kyle Connor followed suit with a goal of his own just 32 seconds later, getting the Jets off to a flying start. The Vegas Golden Knights drew even by the mid-second, but the Jets went back-to-back again in the final minute of the middle frame, including a dagger goal by Adam Lowry with four seconds left that allowed the Jets to go into the second intermission up 4-2. After the Golden Knights cut the lead to 4-3 just eight seconds into the third, Patrik Laine scored his second of the game (his first goals since Jan. 13, a stretch of 15 games) and Andrew Copp potted an empty-netter to round out the well-deserved 6-3 win. When the number of goals you score in one period can be described as a touchdown, you know you’re having a great game. The Jets scored early and often in this Saturday-night tilt against the Anaheim Ducks. Interestingly enough, the man who made the biggest mark on the proceedings was a question mark leading up to the matchup after leaving the morning skate with cramping. Jack Roslovic, after taking the warmup and declaring himself fit to play, notched his first-ever NHL hat trick. Copp opened the scoring at 2:07, and Roslovic followed it up with a power play goal at 5:26. Then Blake Wheeler, Bryan Little, Roslovic again, and Brendan Lemieux pumped goals past poor John Gibson in less than a six-minute span. It was the first time the Jets had ever scored six in a single period and the first time since 2007 an NHL team went into the first intermission up by that many. The Jets would go on to add three more goals in the 9-3 Duck hunt —just the second time they’d scored nine in a game since relocation from Atlanta. Copp actually had a glorious third-period breakaway chance to get the Jets into double digits (fans chanted “we want 10”) for the first time ever, but was stoned by backup goalie Chad Johnson. 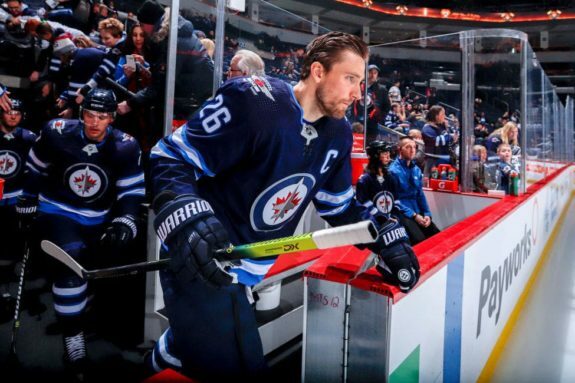 Usually, Wheeler dishes the puck to others — he finished third in the NHL with 71 assists this season. On this night, though, he showed himself more than capable of getting in on the goal-scoring action. Wheeler — who came into this contest against the Columbus Blue Jackets with 13 goals on the season — lit the lamp for four. His first two were deft re-directs off point shots from Dmitry Kulikov and Nathan Beaulieu, and broke 1-1 and 2-2 deadlocks, respectively. In the final three minutes, he rifled his third of the night past Sergei Bobrovsky’s blocker side and added an empty-netter for his fourth. The win chuffed Wheeler and Jets fans, no question, but no one more than Thompson, Manitoba resident Wanda Nabess. Thanks to Wheeler’s outburst, she won a cool $100,000 dollars via the Safeway/Sobeys Score & Win Contest. The Jets rolled into Raleigh on March 8 and acted like a bunch of jerks to the home team and the “Cane-iacs” fanbase. Coming into the game, the Carolina Hurricanes were on an 8-1-1 heater in their last 10 and were lighting up social media with their creative-but-controversial “Storm Surge” celebrations. However, the Storm Surge, on this night, was but a summer breeze that couldn’t cause the Jets any turbulence — they soared an 8-1 victory. Deadline-day acquisition Kevin Hayes got the scoring started early, batting his own rebound out of midair and beating Curtis McElhinney, who was later victimized for three straight by Wheeler, Ben Chiarot, and Ehlers before the first intermission. The Hurricanes simply had no answer for the Jets, who used their immense speed and skill to build up an impressive 6-1 lead before potting two more in the final minute for good measure. Adam Lowry, who rounded out the scoring with 19 seconds to go, even payed mock homage to the Storm Surge with this cheeky post-game celly. A hat trick for Connor. A shutout for Connor Hellebuyck. A playoff spot locked up. What more could a Jets fan possibly ask for? The Jets came into the matchup with the Nashville Predators two points up on their biggest rival for top spot in the Central Division. The anticipation was palpable and the fans were pumped. The inspired game the Jets put together — one which the Predators could simply not match —showed just how desperately the Jets wanted the W. They really got going in the second period when Connor scored a goal-of-the-year candidate shortly after a disallowed Predators tally. He took a pass from Hayes, corkscrewed the flat-footed PK Subban with a gorgeous toe-drag, and deposited a backhander over Pekka Rinne’s glove and in. Copp and Hayes would follow up with goals less than two minutes apart later in the period to help the team build a 3-0 lead. In the third, Connor scored his second of the game on an in-tight backhander before completing his first-career NHL hat trick by slamming in a perfect dish from Laine with just nine seconds left, sending fans in to a frenzy and completing the 5-0 score. It was a truly memorable night of hockey in downtown Winnipeg and one in which Bell MTS Place was simply electric — the decibel levels exceeded 110 at times and chants of “first in Central” rained down — and exuded playoff-type vibes and an energy level it hadn’t all season. There hasn’t been much excitement in Winnipeg since moment number one. The Jets posted a 2-4-1 record between then and now and squandered their chance to finish first in the Central for the first time in franchise history in the process. It’s led many fans and pundits — this one included — to rightfully ponder whether they’ve got the capability to contend for the Cup this spring. TSN’s Travis Yost even went so far as to call them “fundamentally broken” at five-on-five. While the team is undoubtedly heading into the postseason like a plane taxing on the runway rather than one soaring triumphantly through the sky, the Stanley Cup Playoffs always bring excitement, because every game is so meaningful. This is especially true in the Prairie city where the Winnipeg Whiteout rages during every home date. Will the Jets be able to recapture the spirit and the drive they showed in their playoff-clinching game and the others above and make a deep run akin to last season’s? Or will they be quickly dispatched by the resurgent St. Louis Blues? If it’s the latter, these great moments won’t be any solace at all.